You know a company is tied to its community when the community is in its own name. We’re proud to call Bremen Castings Inc. an Indiana Chamber member, and sincerely congratulate this Northern Indiana company for its milestone this month in celebrating 75 years in business. We featured this innovative company in BizVoice magazine last year, so check out the article. And being a social media person, I enjoy seeing how Bremen Castings honors its employees in its social media feeds. A thoughtful way to include staff in the company’s messaging. Be sure to get BCI’s updates on Twitter and Facebook. 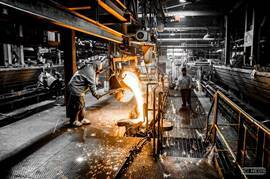 The iron industry has been around for generations but over the years, the face of foundries has shifted away from small, family-run businesses to large corporations. Bremen Castings Inc. (BCI) in Bremen, Indiana, is not one of them. The family-owned foundry will be celebrating its 75th anniversary in March and James (JB) Brown, President of Bremen Castings, credits the longevity and success of the company to its forward thinking business model, streamlined day-to-day operations, and above all, having each employee feel as though they are a member of the Bremen family. Originally named, Bremen Gray Iron foundry (the name was changed to Bremen Castings Inc. in 1972), the company was established on March 17, 1939 by Ellis Brown, Charles W. Kling and Harold Heckamen with an initial investment of $10,000. Some of the first customers included Bendix Corporation, Clark Equipment, and Ford Motor Company. Since its inception, Bremen Castings has grown from an 800 square foot building to its current 125,000 square feet with more additions planned for the future. The company has continued to stay at the forefront of the foundry industry, having won numerous awards for its safety, technology and environment-friendly manufacturing. Today, Bremen is still privately owned and operated by the Brown family. This entry was posted in BizVoice, Business News and tagged bremen, bremen castings, indiana, manufacturing by Matt L. Ottinger. Bookmark the permalink.